Jersey Boys is the story of Frankie Valli and the Four Seasons – how they got started and eventually split for various reasons. It’s narrated in turn by each of the guys, though Tommy Devito and Bob Gaudio seem to take up most of the narrating time. I’m not sure how much of the story is true and how much is dramatised, but for the most part I thought Jersey Boys a generally entertaining story. It bobs along at a rapid pace, which was fine except that I thought the final third of the show was too rapid. Some things, like Frankie Valli’s daughter’s death, didn’t have as much emotional gravity to me as they ought to have had because there hadn’t been a sufficient build-up to it. The focus, especially in the first half, was very much on the formation of the band, which meant that everything else got sidelined and when some points were brought back later and meant to be more emotional, it didn’t hit the right notes for me because it all seemed so vague. The acting was good, as far as I could tell, and the South African cast did a splendid job with the American accents – those American Italian drawls. Very nicely done indeed. (I admit that I was slightly distracted by the guy who played Tommy Devito because he was rather good-looking and also looked a bit like Joseph Gordon-Levitt at some angles… ) The only flaw was in the three girls who sang “My Boyfriend’s Back”. They just did not impress despite having such a fun song to sing. On the music side, it’s probably more similar to Mamma Mia! in that the songs were not written for the show, but are actual pop songs that have been in existence for quite some time. However, I liked the songs used in Jersey Boys much better than I did the ABBA songs in Mamma Mia! – because I have a distinct soft spot for the ones that leaned towards the doo-wop/rock ‘n’ roll sound. There isn’t much in the way of choreography, but I thought the simple little dance moves were charming. The staging was fairly simple and basic compared to other musicals like The Lion King and Les Mis but I think it served its purpose perfectly well. I thought the vaguely Roy Lichtenstein-esque cartoons projected as backdrops for many of the numbers were clever and fun. But what I thought was brilliant was the way they handled the Four Seasons’ TV performances: Having actual cameras pulled on stage and the band performs facing the cameras – cameras which (I presume) have a live feed and so their image is projected up on the screen in appropriate black-and-white, sometimes intercut with sequences of audiences from the ’60s so it looks like they’re projecting real videos from that time. For a few moments I did wonder if it was indeed actual videos of the Four Seasons that they’d dug up from somewhere, but then realised that it was a real-time projection. From that point on, those scenes were my favourites. Check out the bit at 2:04 to see what I mean. So how does this hold up against all the other musicals I’ve seen? Hmm. Not bad at all. It’s not the best I’ve ever seen but if I ranked them according to the level of my enjoyment, this might be somewhere in my top ten. 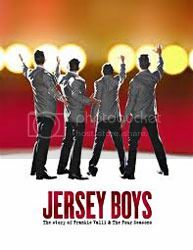 Jersey Boys, like Wicked and Grease, will be easy for people who are not accustomed to or who are not that crazy about musicals to appreciate. I wouldn’t recommend taking impressionable young children to it though, since the language can get quite coarse. Otherwise, it’s easy to enjoy, especially if you like that sort of music.